I went to a benefit for Donnie Norton a couple of weeks ago at the Walnut Fire Department out on Hwy. 25-70, west of Marshall. Donnie has had some serious health issues over the last couple of years and had to retire from his job as an asphalt roller with APAC. I’ve known Donnie and his family since 1975 - he is one of Dellie Norton’s great-grandchildren - and I knew everyone would be comfortable with me making photographs. I especially wanted to make photographs of Donnie with his grandson Elijah, which I did. I was thinking to do a pretty standard portrait, framed tightly with little or no background, both people looking straight into the camera. I was shooting with my digital Canon SLR. 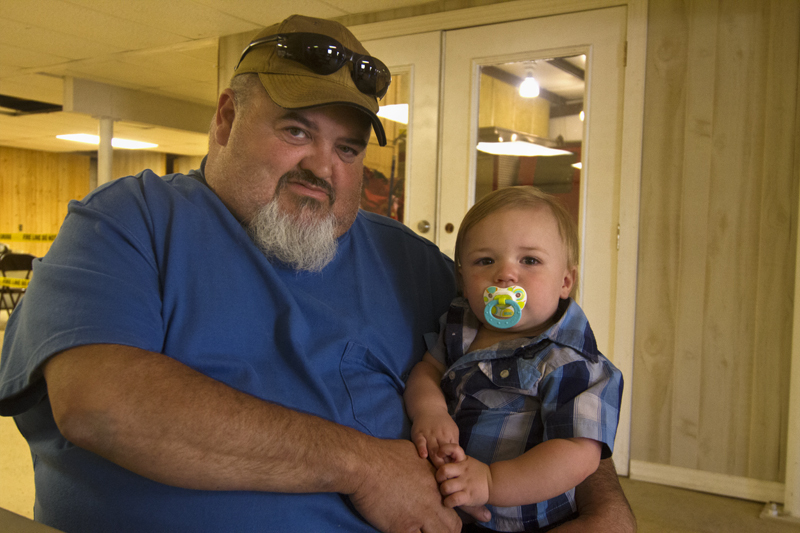 This first photograph is close to ideal – proud grandfather securely holding his tentative grandson. Donnie is a big, broad man, but my distance from him and the focal length of the lens keep him from seeming imposing. It’s a warm image, in both tone and feeling. It’s happy and optimistic and consistent with a classic genre of photographs. It’s been done millions of times and most of us have similar images in our scrapbooks or on our Facebook pages. I knew the family would love it, and they did. Those situations usually demand a series of exposures. Facial expressions, especially with children, change so quickly that a photographer will generally not rely on a single image. He wants a number of pictures to look at before he chooses the best one. That was my situation with Donnie and Elijah. Eleven frames later, probably less than two minutes, I made this second photograph, which has a totally different feel than the first one. The obvious difference is I chose to present this second one in black and white. Stripped of the warmth and distraction of the color, the photograph is all emotion. I got closer and tighter, which immediately makes Donnie appear larger than life. With a small tilt of his head, a slightly different camera angle, and dead seriousness of his eyes, he appears ominous. 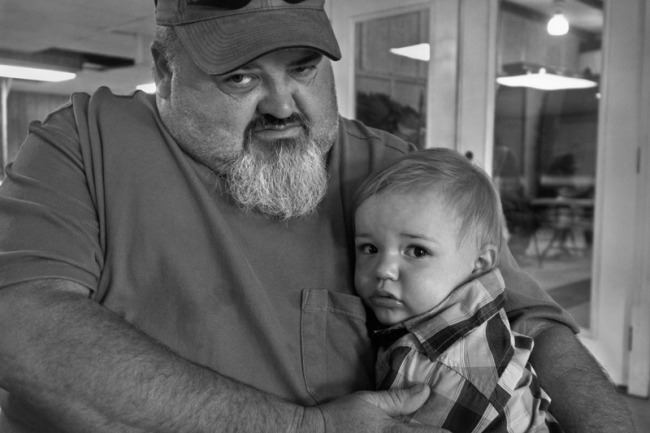 Elijah, sans pacifier, has evolved from tentative to fearful and his grandfather, while still in the same secure posture, now seems to be protecting his grandson from an imminent threat. What interests me is the camera’s ability to fashion the message from a picture. Virtually nothing had changed about the emotion of the situation from one image to the next. Yet, with only minor alterations in technique and camera placement, a radically different storyline develops, one more powerful and ambivilent than the first. We like to think the camera doesn’t lie and I think there is truth to that statement. But I also believe a picture is worth a thousand words and oftentimes those words can be contradictory, not necessarily truthful, or complete regarding any particular situation.